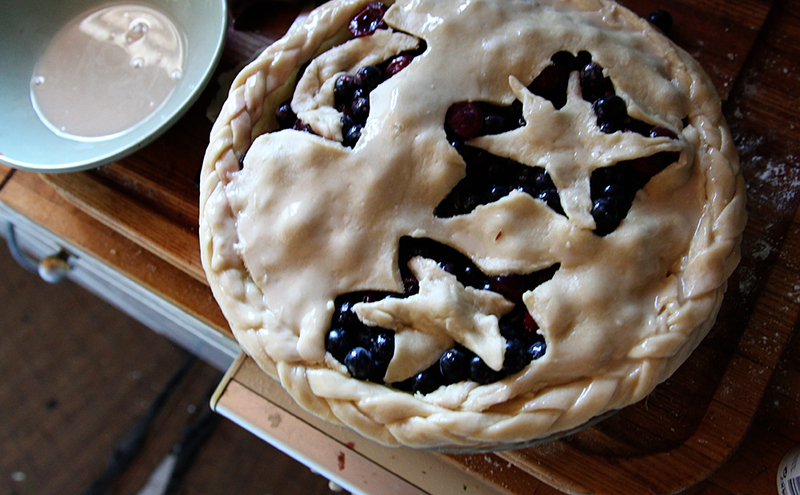 I wanted to make a cherry pie but I did not, in the end, have enough cherries to fill the big pie dish I was using. So I ended up combining three types of cherries – jarred, frozen and fresh – alongside two cartons of fresh blueberries. It turned out so sweet I only needed to use one cup of sugar in the reduced cherries part. It’s best if the fruit makes its own sugar but of course sometimes that’s not possible. These fruits were plenty sweet enough. 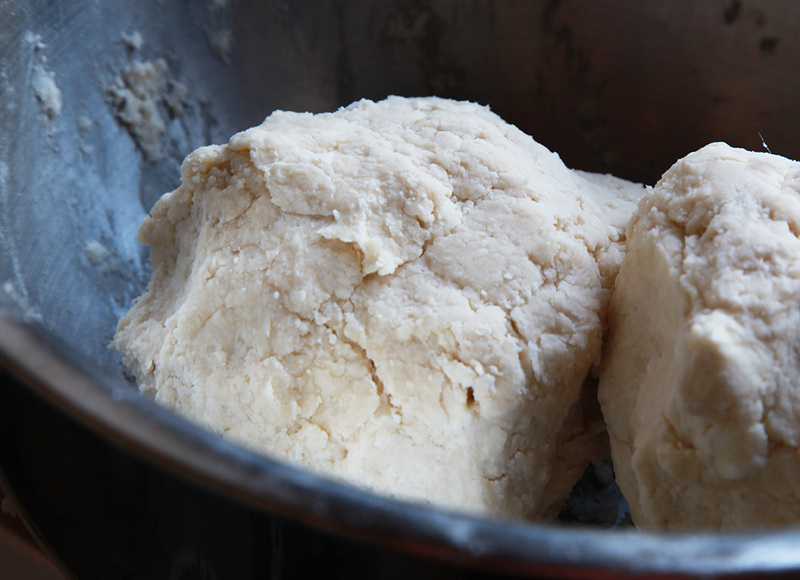 About vegan pie dough. 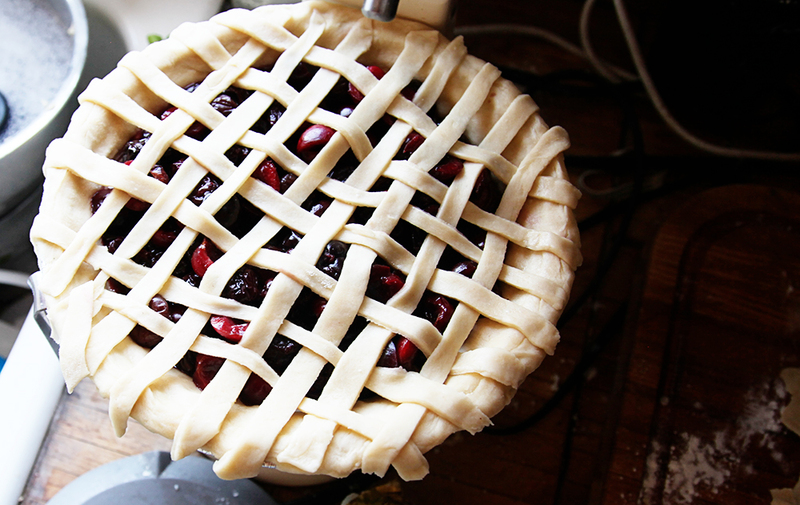 I’ve been making pie dough for so many years turning it vegan wasn’t that hard in the end. 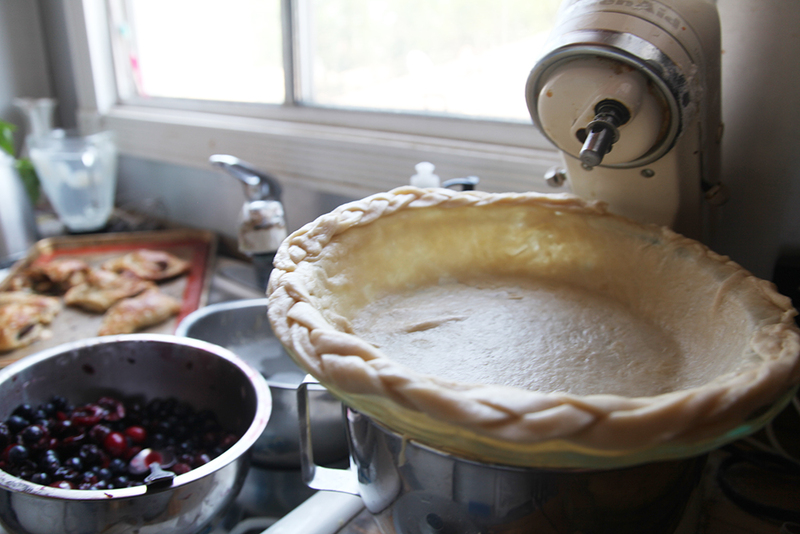 I’ve been making pie dough every which way you can imagine – using a food processor, a pastry cutter, two knives and my fingers. I am firmly behind Dorrie Greenspan’s pie crust recipe for traditional crust. Hers is by far the best I’ve ever used and it entails using both butter and shortening, along with making sure everything is dead cold when you start to mix it. But vegan pastry is a tad different. 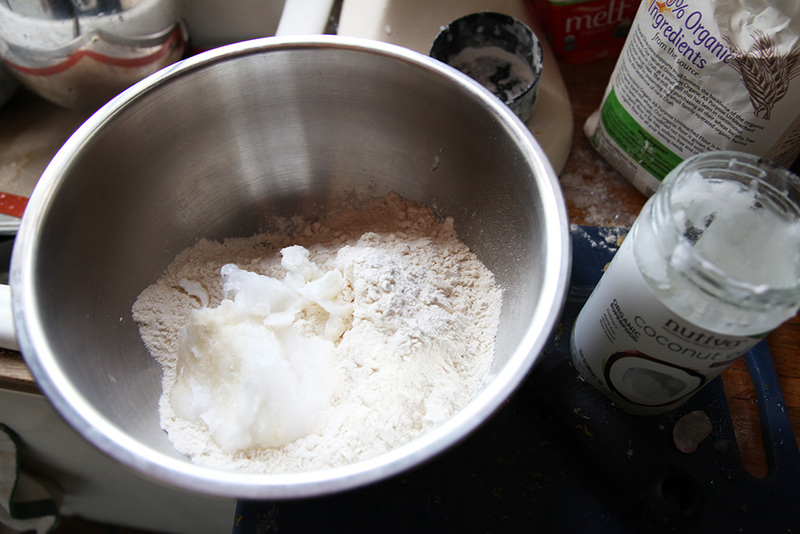 If you’re using coconut oil it can’t be too cold or it won’t work at all in the flour because it will be too hard. If it’s too soft you will mess up your measurements and it will feel weird – either too wet or too dry. But if you use vegan butter you can get a little closer to regular pie crust. I could not find any unsalted vegan butter so I used coconut oil for this particular recipe. Plus, I think cherry and coconut make a nice combination. Actually, coconut almost always makes a good flavor for any kind of fruit pie. It does NOT work for savory pies unless you are making something that wants coconut flavoring in it. Most don’t. So, the next time I make pie crust I’m going to experiment with the vegan butter you get at Whole Foods. This time I used coconut. 2 1/2 cups flour to 1 cup soft but still solidified coconut oil. 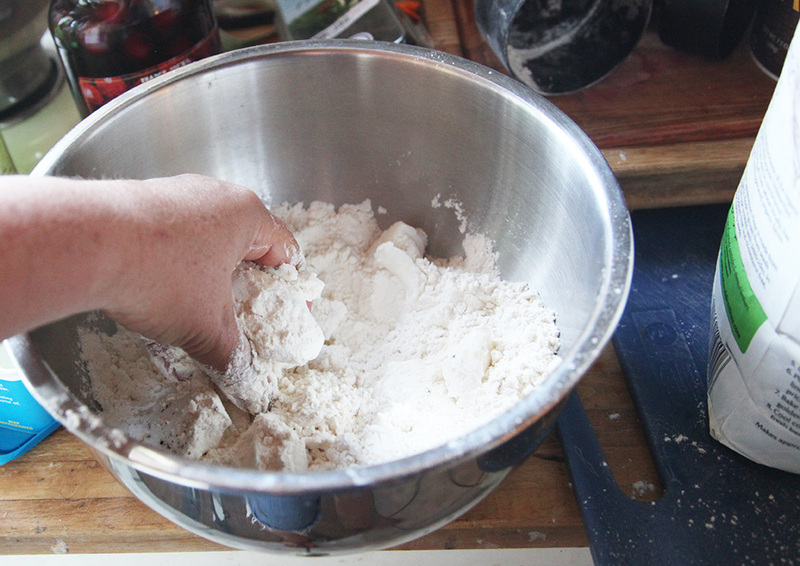 I use my fingers to feel the consistency, which is a no-no in most pastry making recipes. The idea there is that your hands are too warm and any kind of warmth takes away the flakiness. But we’re not working with butter and flour – we’re working with oil and flour. So far I have not discovered this type of combo to produce particularly flaky crust. But perhaps I will figure that out one day. 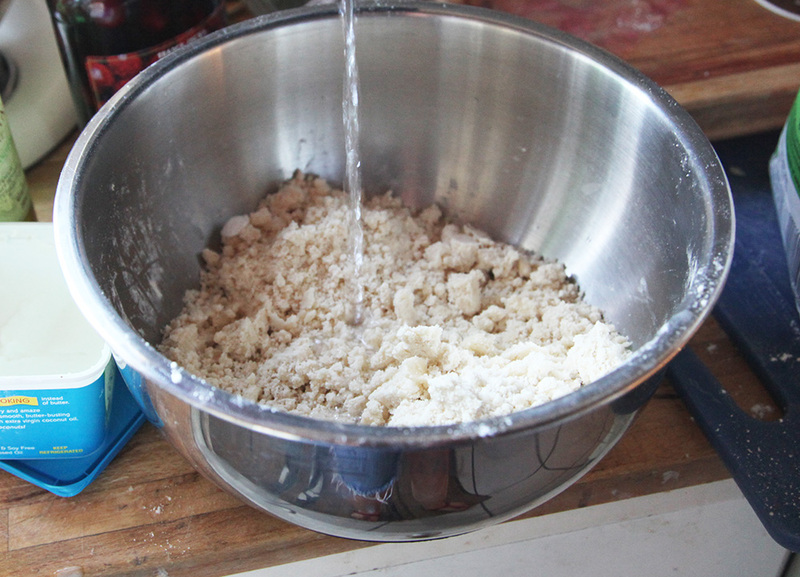 I pinch the oil into the flour until it resembles, as with most recipes, small peoples or meal. Then you add a teaspoon of salt and a half of a cup of sugar (you will need this) before you add your ice water to bring it all together. You could mimic this exactly if you use vegan butter and vegan shortening. Just be careful with the salt if the butter is salted. 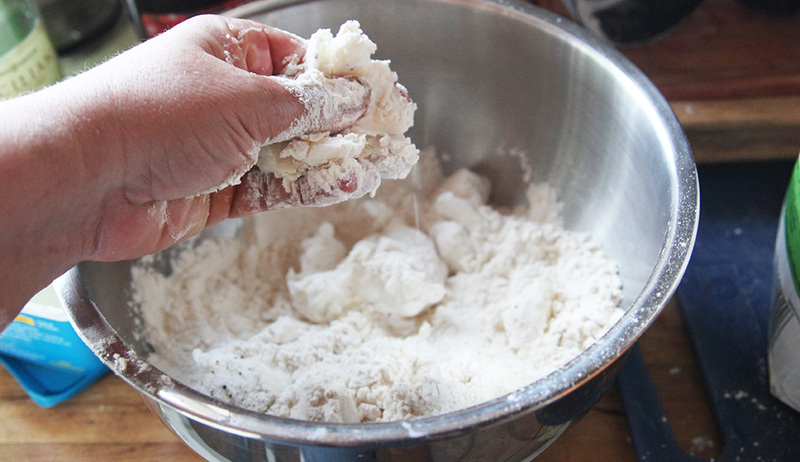 You drizzle the ice water in until the dough ball comes together. Here’s the important part. If you’re working with coconut oil, make sure NOT TO FREEZE the dough. Coconut oil because SO HARD it will take forever to roll it out. Vegan butter is a bit more forgiving. 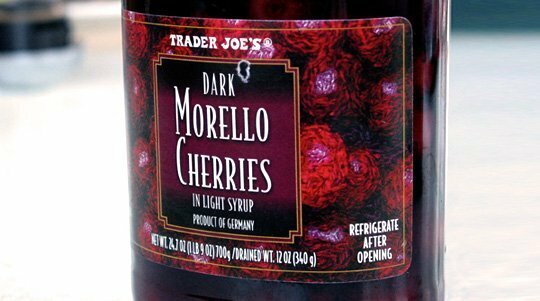 The first thing I did was use a jar of Morello Cherries from Trader Joe’s, add a half cup of cognac, 1 cup of sugar and boil way way down to a syrup. Let cool once cherries start to pucker a little. Next, in a big bowl put all fresh cherries (once you painfully and dutifully remove the pits) and a bag of frozen cherries, plus two cartons of blueberries, in. Mix in the syrup and stir. Then add some lemon juice and some lemon zest. You do NOT want to leave this out. You roll out the pastry, fill the pie and bake at 350 until the crust is brown and the filling is bubbling through the holes.